85 years of military neuropsychiatric service was marked at the Military Medical Academy. The event was attended by Jadranka Joksimovic, Minister of European Integration in the Government of the Republic of Serbia, Bojan Jocic, State Secretary in the Ministry of Defence, Meho Mahmutovic, State Secretary in the Ministry of Health, Nenad Neric, State Secretary in the Ministry of Labor, Employment, Veterans and Social Affairs, Rector of the University of Defence, Major General prof. Dr. Mladen Vuruna, Acting Head of the Military Healthcare Department, Col. Dr. Ugljesa Jovicic, academics, directors of health institutions, professors, employees and retired members of the neuropsychiatric service, cadets of the Medical Faculty of the MMA. On behalf of the Ministry of Health and Health Minister, State Secretary Meho Mahmutovic congratulated the jubilee. - It is a great thing when civilian and military healthcare are together and this should always be the rule. Doctors are the foundation of every society. There is nothing without doctors. Doctors help sick people get well and keep well people healthy. If you have a healthy population, then you can do everything else. With good reason is a saying written at your door that a sick person has one desire and healthy one a thousand" said State Secretary Mahmutovic and wished military neuropsychiatry to delegate their knowledge. - At every medical meeting, it is my pleasure to say that nothing begins or ends with us. It is always important to mention your teachers, when you mention people who made and built something before us. Those people left and laid the foundation for us today to be able to continue the work and leave something good and high quality work for future generations. Neuropsychiatry is a serious branch of medicine, a joint story in which we all do our best to keep a person healthy first of all - said the State Secretary. - Illnesses and disorders that you encounter in everyday work, regarding the treatment of psychosis, posttraumatic stress disorders, cerebrovascular diseases are predominantly causes for deterioration in the quality of living of the community as a whole. Your work results in several decades with all specific difficulties speak in favor of the tradition from the time of the first military neuropsychiatrist Dr. Jordan Tasic and the tradition is respected in our institution. Colonel prof. Dr. Miroslav Vukosavljevic pointed out that neurology and psychiatry require constant and profound professional training, but also a huge knowledge in general medicine, in order to understand the complexity of treatment of a single, and in every sense specific patients. He congratulated the audience on the jubilee and said that the results of their work were visible in a large number of successfully treated patients. The participants were greeted by the Head of the Neuropsychiatric Group of Clinics, Colonel prof. Dr. Ranko Raicevic. 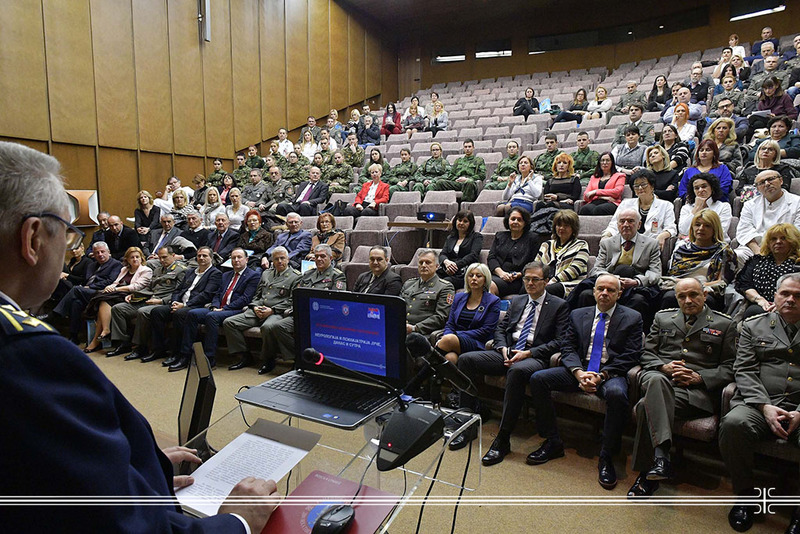 He pointed out that this is a great jubilee and a great day for military healthcare and for the medical community of Serbia, but that this anniversary would not be possible without many generations of people from all profiles - from teachers to medical technicians and nurses. He mentioned the magnificent Dr. Jordan Tasic of one of the "1,300 Corporals", the founder of military neuropsychiatry. - This is also the jubilee of the neurological and psychiatric community in Serbia because we are an inseparable part of the medical community in our country, and students of numerous top teachers of Belgrade and other universities in Serbia and the former SFRY. He briefly pointed to the role of neurology to be understood on the basis of the fact that vascular brain diseases, epilepsy, neurodegenerative diseases, parkinsonism, dementia, and multiple sclerosis represent in total the third cause of morbidity and death in the modern world, and according to the cost of treatment in 27 countries of 29 of the European Union they are unfortunately at the first place. These data, he said, are much more dramatic in our environment. He said that in future, both services will endeavor to maintain a recognizable place in the medical profession and science, resolved to leave space and potential for future generations to be even better and more successful. "This is a symposium dedicated to military neuroscience and military psychiatry, but with a clear message that we have been, we are now and will always be part of the medical community in our country performing the special task of providing medical care to those in need," said Colonel prof. Dr. Raicevic. In an introductory lecture, which opened the second part of the celebration of the anniversary, the Head of the Group of Neuropsychiatric Clinics of the MMA said that from 1984 to the present, there were more than 7,000 patients treated in both clinics, 60,000 examined in outpatient clinics, in the ER more than 140,000 patients were examined and over 100,000 diagnostic procedures were done.